I'm not an expert either in Photoshop or Illustrator. Well, I've mid level skill in Photoshop. But in Illustrator, I'm simply a beginner. Even I don't have a basic skill in Adobe Illustrator. Few days ago, I faced a serious problem while creating a table in Illustrator. I searched for a long time but failed to find the proper option to create a table. Today just few hours ago I searched the topic on Google - How to Create a Table in Adobe Illustrator? Many results appear as usual. I chose one from them and learned how to create table in Illustrator. Step 1: Run Adobe Illustrator and Open a New Document by pressing Ctrl + N. Choose any paper size you wish. It doesn't matter. Step 2: Now you have to draw a Rectangle. Look at the image below to know where the rectangle tool is located. 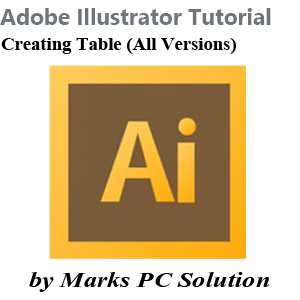 In Adobe Illustrator CS6, the Keyboard Shortcut for Rectangle Tool is M. You can also press M to enable Rectangle Tool and then draw the size of your table. Step 3: Now you have to split the newly created rectangle. But before that make sure the black color is selected in the Color window. Also make sure the rectangle is selected. Now go to Object menu > Path > Split into Grid... . Take help of the image below if necessary. Step 4: Now you get a new Window named Split into Grid. Type the number of Rows and Columns in the box and then hit OK.
Windows 8 Developer Preview was released at the end of 2011. Couple of months later, Microsoft released the Consumer Preview version of Windows 8. Couple of weeks ago, another trial version was released- Release Preview. And we got the final version of Windows 8 just few months ago. Windows 8 has brought a revolutionary change for the users. It includes many exclusive features which were not available earlier! Microsoft expected that Windows 8 will be able to attract the existing as well as new customers. But even with so many exceptional features, Windows 8 was not so popular in the market. Many new users of Windows 8 was puzzled while using it. New Start Screen, disappearance of Computer icon from the desktop, absence of .Net Framework 3.5 were some of the prime reasons behind this failure. Still Microsoft is trying to make the new Windows popular. And Windows 8.1 is a part of such initiative! After the releasing the final version of Windows 8, some were talking about Windows 9. Some told the next version will be Windows Blue. But when Windows 8 failed to capture the market, Microsoft started thinking about how to make it popular. Because in 2006, they experienced a major problem with Windows Vista. That was the worst OS ever released by Microsoft. Definitely Windows 8 is much better than 7 or XP. But as the users have failed to cope up with the new OS, it has been a serious issue to think about. A free update to Windows 8 is coming at the end of this year called Windows 8.1. 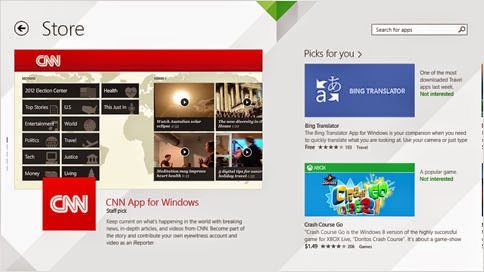 And before making it available for the users, Windows 8.1 Preview has been released including new apps and services! No special requirement is necessary for the preview version. If your PC is capable of running Windows 7 or 8, the 8.1 will also run. Remember, Some tablets and PC with newer 32-bit atom processor may not support Windows 8.1 Preview! View Details . . .
Microsoft haven't mentioned anything directly about what's new in the new release. But they released a product guide for the users- Windows 8.1 Preview Product Guide. Internet Explorer 11 is available in the Preview Version! 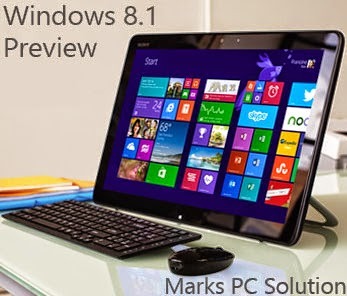 Who should Try the Windows 8.1 Preview? If you're using a blogger blog, then you should notice some major changes in its HTML editor. Google made those changes couple of months ago. You will see the code is colored, folded and very much structured. You will also notice some new buttons which were not available earlier. What are the uses and benefits of these buttons? Read more to know . . .
Only a few days ago, I published a post on Blogger vs. WordPress. In that post I said - WordPress is matured, but there is a continuous improvement on Blogger. And the new HTML template editor of blogger is a part of that improvement! Today I will discuss about how to work with the new html editor. I was very much angry after such a change in the template editor. Because several times I was puzzled by the new options and interface. But as soon as I got familiar with the new editor, I really like it. If you're familiar with all the new options I think you will also like it. Tips: Backup the current template to avoid any mishap! Line Number: Each line of the template are numbered. When editing the template, if you made any error then error message will be shown as - error on ### line. Thus you will know exactly where you made mistake. Folded Code: You may face problem due to the folded code. In the above image, look at the line number 1078. After 1078 there is line number 2033! More than thousand lines are hidden. Clicking on the folder marker ' ►' you can show those hidden lines. Jump to Widget: This button is really helpful for navigating through the template. If you click on the down arrow, you will see the parts of your template. You can go to any part by a single click. For example- Blog 1, HTML 1, HTML 2 etc. Format Template: Don't be confused. It will not delete your template! When you format your flash drive then all data are erased. But here format means formatting the template. If you hit on the Format button, the indentation of your template will be corrected automatically. Revert Changes: If you hit on this button, the unsaved changes will be removed automatically. Suppose you made some random changes in your template. But before saving it, you can't remember whether everything is correct or not, in that case you can hit this button to cancel the changes you made. Search Box: As more than thousand lines of your template are folded, you can't find your desired part of the code by using the browser's search box. That's the new editor gives you a new search box. To activate the search box you have to click on any part of the editor. Then Press Ctrl + F to enable search. Press Shift + Ctrl + F to find and replace. Press Shift + Ctrl + R to replace all. Old options are also available along with these new buttons. You can preview your template by hitting on Preview Template button before saving it. Or if you would like to back to the default settings of the widget then click on the Revert Widget Templates to Default button. 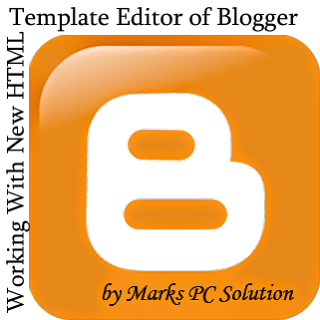 Keep visiting Marks PC Solution for more Blogging Tips! While creating a blog in blogger, you have to name your site and enter the URL. But choosing an appropriate name for the site with perfect URL is not a very easy task. You should think and research about what will be the Title, Description and URL of the site. Because they have a great impact on search results. Here I’d like to share my personal experience. 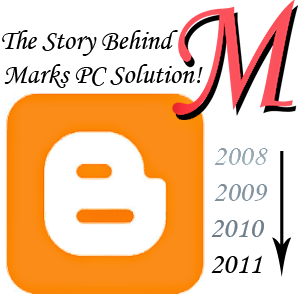 When I created Marks PC Solution 4 years ago, I was simply a novice in blogging. In that time I didn’t think much about the URL. I used munnamark.blogspot.com as my URL. But it doesn’t match with the blog title. The URL should be well-matched with the title. If the URL and title are related, then your site will be easily on the first page of the search result. If you search Marks PC Solution on Google, it will be the number 1 in the search result. Thousands of links across the web have helped my site to be first in the search result. But if my site URL were something like that- markspcsolution.blogspot.com or markspc.blogspot.com, then it will be the number 1 even without so many backlinks. If the blog title and URL are similar, then it is easier for that site to be appeared on the first page when searched by its title! There are many sites which include the words PC Solution. But only 2 or 3 sites may have the word Mark of Marks with PC Solution. The word- Marks makes the title unique. And when you search Marks PC Solution on Bing or Google, my site will be the top in the search page. Naming a site is just like naming a baby, or naming a movie. It should carry a meaning. Never pick a name that doesn't represent the site’s contents. Blog title shouldn't be very common. Pick a unique name if possible. It shouldn't be very long. Keep it less than 20 characters. The title should be easy to spell, pronounce and remember. The description is what the visitors see just below the title. It is not much important for search engines rather it is important for the readers. Because the search description describes your site. It tells the visitors what the site is about. But the search description is different. Read more . . . If you closely analyse this description, you will realize none of the posts of this site is out of this description. In that sense, we can say, our description is perfectly matched with the site’s contents. Never mention needless words there! This is definitely an important part of SEO. A good URL can bring success in search results. Remember, an established site’s URL doesn’t need to be changed even it is not matched with the title. If you change the URL, it will degrade your SEO position. And you may have thousands of links on the web. Those links will be wasted. Though you can redirect your site to the new URL somehow. But definitely you’re gonna lose the links you’ve shared on social sites like Google +, Facebook, Twitter, Linked in etc. URL should be as short as possible so that users can type it quickly. The more the URL is related to the title, the more benefit you will get from the search engines. URL should be easy to remember. Choose an URL which has a meaning. But never try to make it similar to the URLs of other sites. Better keep it unique. For example- munnamark.blogspot.com. You will never find an URL that includes the word munnamark. This is unique! Before changing the Blog Title, Description and URL, be careful about the negative effects of these changes. I suggest you to read the whole article again to know more about naming and describing the site. Okay let’s start. Sign in to your blogger dashboard. Now click on the Basic button and look at the image below. Title, Description and Blog Address are marked. And at the right of each item you will see an Edit button. To change the Title, click on the Edit button. Then choose a different name. By the same way you can change the description. Advice: Never try to change the name and URL of your site unless it is essential. Never try to change it just to play. Because your social sharing links, other backlinks and search index will be infected for sure!